PLC communications has grown and changed over the many years since the controller’s inception decades ago. Industrial needs and technological advances have kept PLC communications evolving, and this post will explore some past and present communication standards, and what the future may hold. PLCs need to communicate to a number of different devices. First, there are devices which are part and parcel of the PLC, such as remote I/O. Next, are other PLCs and control devices, such as motor drives and servo controllers. Communication with some type of operator interface device is also often required, as is Internet connectivity. Finally, PLCs often communicate to server level PCs running various manufacturing related applications. a shared protocol, which is the common language allowing each device to understand what the bits and bytes in the communication messages mean. Back in its infancy, PLC communications were typically proprietary, with each supplier having their own closed connections and protocol. This made communications relatively simple among a single supplier’s products, but devilishly complex if you chose to venture outside the realm. These old, proprietary communication methods still have their place, as they allow quick and easy connections among a single supplier’s products. For simple systems with no plans to expand or connect to other components, proprietary communication is an option and will continue to be for quite some time. Many PLC suppliers still support these older physical, wired connections—most often based on RS-232C, RS-422 and RS-485 connectivity—and the related proprietary communication protocols. For example, some AutomationDirect PLCs use a serial RS-232C or RS-422 physical layer network with the DirectNET protocol for communications. This protocol can be used for PLC-to-PLC communication over a point-to-point or multipoint network using standard PLC instructions, or to talk to AutomationDirect’s C-more HMIs. When the control system requires venturing outside a single supplier, communication standards come to the forefront, starting at the physical layer. Many times the physical layer is confused with the physical medium such as the cable, connectors, network interface cards and wireless transmission hardware. It’s not physical in that sense, although the physical layer does define the required mechanical and electrical interface to the physical medium. 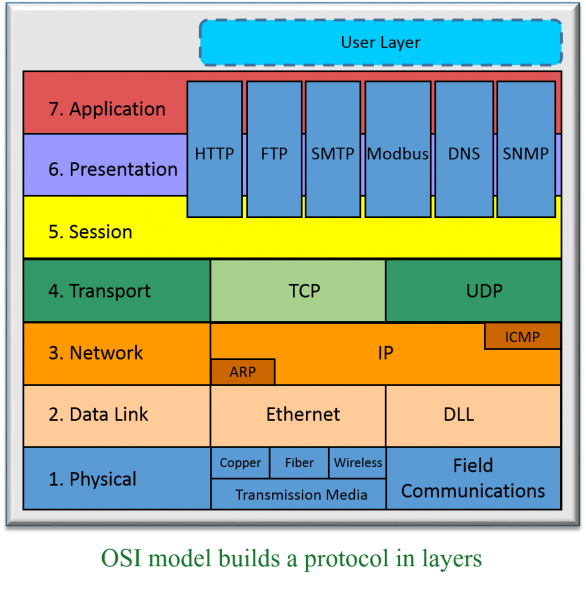 The physical layer defines how to connect the upper data link layer in the Open Systems Interconnection (OSI) communications model within a computer to physical devices. It is basically the hardware requirements with schematics and specifications for successful bit-level communication to different devices. The physical layer not only defines items such as bit rates, transmission electrical, light or radio signals, and flow control in asynchronous serial communication, it also defines types of cables and the shape of connectors. RS-232, RS-422/485 and parallel interfaces have been around for decades and are still in widespread use. But Ethernet, USB and Bluetooth are the physical layer protocols most commonly specified in new products and applications, and represent the future direction of PLC communications. The physical media and connections are affected by the type of physical layer chosen as it defines the cable type, topology, number of devices, maximum transmission speed, and maximum cable distance. For additional information, be sure to check out this application note on Ethernet Fundamentals and this informative article on Demystifying Network Communications. Perhaps the most common industrial serial communication protocol is Modbus RTU, developed by Modicon, which usually runs on an RS-485 network. This and other popular serial protocols are supported by a wide variety of suppliers, and are very familiar to a wide group of automation professionals. But performance is limited, making serial protocols a poor choice for high speed and other demanding applications. Because of performance and other advantages, Ethernet has emerged as the dominant standard for the physical layer of many industrial protocols such as EtherNet/IP, Ethernet TCP/IP, Modbus TCP/IP and Profinet. And unlike serial protocols, multiple Ethernet protocols can run on the same Ethernet physical layer. Using Ethernet, it’s not too difficult to interconnect several devices such as PLCs, HMIs, field I/O and valve banks. Plus, the communication remains fast while talking to several dissimilar devices on the same cable, due to the very high speed of Ethernet as compared to older serial networks. Today’s physical, wired layer is moving to Ethernet for most control system communications. Wiring, connectors and managed or unmanaged switches are now standard—with a wide variety of devices capable of connecting to the Ethernet hardware and industry-standard networking technologies. Most users just need to interact with the physical Ethernet layer, plugging in the cables and letting the protocols worry about error-free communication. 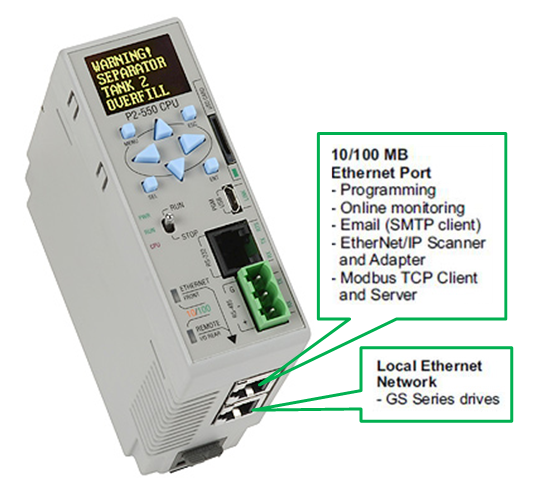 Popular industrial Ethernet protocols like EtherNet/IP and a common network infrastructure allow consistent data and communication from the HMI and desktop PCs at the information level—through the PLCs, HMIs, servo controllers and drives at the control level—to the device level distributed I/O and field components. And, of course, Ethernet is the portal to the Internet which allows a PLC to communicate worldwide. Some PLCs have built-in web server capability, allowing access to it from any web browser. The prevalence of Ethernet communication in industrial automation could result in even more standardized communication protocols in the near future. But for now, if your system is simple, a proprietary protocol may be the best solution. When requirements grow in terms of speed, connectivity or expansion, an Ethernet protocol may be the way to go. For more information on what to consider when considering Ethernet, please see this article Industrial Ethernet or Fieldbus Network.